In the wake of an unprecedented presidential election and President Donald Trump’s new administration’s contentious actions, campus has witnessed a spur of politically-driven student activism. However, examining the University’s history of organized action reveals the undeniable trend of student activism on campus. Assistant Professor of History Jennifer Thomson teaches a class every fall called “Radicals and Reformers,” which focuses on impetuses and varying levels of efficacy for activism and social change, especially in the United States and as they pertain to younger generations. She believes the University is “less active” than other campuses, but that “activism is certainly not a new thing.” Two major student activist movements highlighted by Thomson were spurred by opposition to the Vietnam War and the South African apartheid. The article was published in The New York Times’ print version with a picture of the Malesardi Quadrangle filled with protesting students. The University joined more than 200 colleges and universities in a nationwide strike/moratorium from May 4–7, 1970 to protest the shootings at Kent State and the Vietnam War, according to The New York Times. The University’s faculty voted to endorse the Student Strike 91 to 54. Numerous professors cancelled class and final exams. “The faculty also recommended that professors, in fulfillment of their teaching obligations, hold make-up classes for students who requested or required work,” an article published in July 1970 by the University’s alumni publication, The Bucknell Alumnus, said. 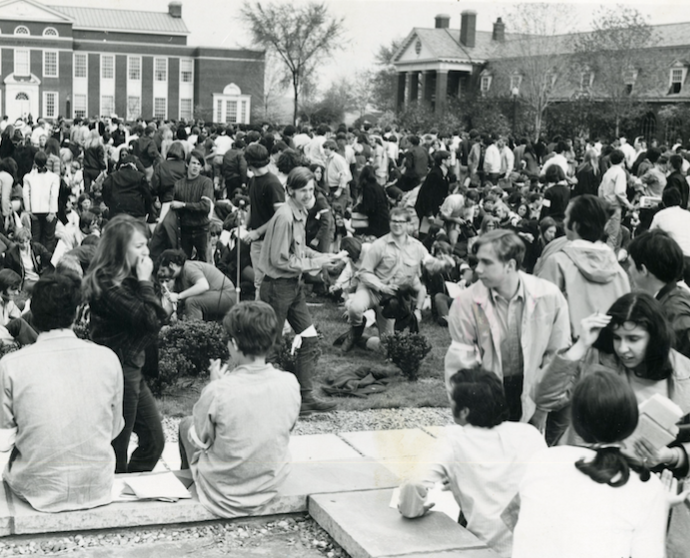 More than 1,000 students occupied the Malesardi Quadrangle in protest, according to Paul Bush’s ’75 “The Crucible Called Vietnam” published in Bucknell World in 1998. This protest was not the first instance of student activism against the Vietnam War. In 1966, a few students organized a chapter of the Students for a Democratic Society (SDS) at the University. John Mahoney ’69 was one of three members of the nation-wide SDS from the University and an especially prominent figure involved in student activism against the Vietnam War. In October 1967, approximately 250 University members attended an event sponsored by SDS called “Speak-Out on the Vietnam War,” according to an Oct. 19 article in The Bucknellian. “Mahoney termed the speak-out a success and stressed that it was not a protest in itself, but a method of providing information and stimulating discussion on the war,” the article said. University Psychology Professor J. Ernest Keen published an article in The Bucknellian in May 1968 outlining Resist, Lewisburg’s intentions and goals. The group identified with the national organization whose primary purpose was to oppose the Vietnam War. In the article, Keen explained the local group’s efforts to inform others about the “legal and moral aspects” of the group as well as supporting any student opposing the draft. Keen’s article addressed disagreement sparked on campus by Resist’s actions. “I think this is altogether appropriate and healthy, for it carries out the long tradition of the University as a forum for the free exchange of ideas in the atmosphere of rational debate and mutual respect. Insofar as Bucknell University allows us to speak, it becomes what it should and must become,” Keen’s article said. On May 10, 1969, an antiwar demonstration disrupted an annual ROTC review on the University’s football field followed by two students burning their draft cards outside the stadium, one of whom was Mahoney. Watts was quoted in the piece as having described the time in disheveled terms. “The campus to minor degree has been invaded by long hair on men and sloppy dress on both sexes,” Watts said. Watts also noted that the only previous challenge to authority had been a sit-in at Bertrand Library in 1963 to extend the building hours, highlighting student activism as a new trend on campus. 1970 was “the apex [of activism] on campus,” according to Bush. After the Student Strike, student activism on campus was less potent. To protest the invasion of Laos, between 300 and 500 students assembled in Vaughan Literature Building and the 1971 resumption of bombings in Hanoi led to another student demonstration on what is now the Malesardi Quadragle. The 1980s would mark the next phase of student activism on campus. Former Professor of Economics Charles Sackrey published a document some years back titled “Student/Faculty Left Wing Politics at Bucknell 1980–2000,” which has been updated since as more examples contemporary activism on campus have occurred. The document outlines how Sackrey, Professor of Geography Paul Susman, and eight students founded the Bucknell Progressive Caucus (BPC) in November 1980 following the election of President Ronald Reagan. The group existed until 2000. “We met weekly as a ‘student-faculty’ group, thoroughly democratic, and at our meetings or in sub-groups we planned and/or participated in virtually all left wing political activity at the university during that whole period,” the document said. BPC produced a monthly newsletter, The Catalyst. The most prominent student activist movement in the 1980s was an anti-apartheid movement. In 1983, four students joined the national movement aimed at forcing universities to sell (divest) their investments in South Africa and worked to inform the campus about their pursuits. “In 1986, impatient that nothing was changing, about a dozen BPC students developed a plan to ‘sit-down’ at the spring meeting of the Board of Trustees. That event, in May 1986, was attended by about 175 people who came in support of the sit-down,” Sackrey’s document said. BPC members were blocked from entering the meeting room. The Board of Trustees president emerged later, announcing the group’s decision to divest. “Later that day, the Board President claimed that the students’ demonstration that day ‘had nothing to do’ with their decision, but he did compliment those students who had persisted with their four-year program of public education started in 1983. Maybe so, maybe not,” the document said. Another prominent area of student activism was in opposition to the United States policies in Latin America. BPC “arranged information lectures or programs on campus, and on several occasions we organized groups from the area to travel to attend rallies in New York or Washington, D.C. against this dimension of U.S. foreign policy,” Sackrey’s document said. Weekly Saturday Peace Vigils in downtown Lewisburg also took place and were attended by local residents, professors, and students. In 1998, an anti-sweatshop campaign occurred on campus. Several demonstrations occurred at local stores that sold clothes made in developing countries’ sweat shops, including Walmart. “The campaign resulted in Bucknell signing on to the Fair Labor Association, which certifies that Bucknell’s store would not sell clothing made in a sweatshop,” Sackrey said. More recently, student activism was reinvigorated with the advent of the Black Lives Matter protests. Mahder Etuma ’16 was involved from the beginning. Jorden Sneed ’17 has participated in Black Lives Matter protests, Stop the Hate Rallies, and other awareness events on campus. “As an organizer of a lot of the current student activism on campus, I believe our purpose is to disrupt ‘business-as-usual,’ in various forms, in order to confront people with information about issues in our country with which students on campus struggle and face,” Sneed said. The most recent iterations of student activism have consisted of the formation of a group called the Bucknell Alternative Delegation (B.A.D. ), which has centered multiple campus-wide protests and walkouts on the basis of protesting both the election of Trump and the University administration’s response (or lack thereof) to the election. B.A.D. has drafted demands and hosted “teach-ins” on a variety of topics ranging from the implications of borders and immigration to Islam as a world religion to contemporary intersectional feminism, among others.